Children at the school hold banners on front of Dun Laoghaire Institute of Art and Design. A GROUP OF concerned parents in south Dublin are staging a protest today over plans to erect a mobile phone mast on a building close to a local primary school. The proposal has been granted planning permission by Dun Laoghaire-Rathdown County Council but the Stop Vodafone Mast Committee is seeking to increase pressure on the various parties to reverse the decision. The proposed mast is planned for the top of Dun Laoghaire Institute of Art and Design, a building located opposite the Monkstown Educate Together National School. Objections from parents have been heard and an appeal to An Bord Pleanála is pending, but today’s protest seeks to increase pressure on parties to the dispute. The parents’ group claims that the mast is located too close to the school, putting 438 students and staff at risk. They claim that the orientation of the school to the mast put the school within the area where the electromagnetic fields would be at their strongest. “The research that is coming out now is that masts near schools are just a no, no,” according to committee member Jennie Cotter. Cotter and the Stop Vodafone Mast Committee argue that government research into potential health effects from phone masts is out of date. Thirty years ago the evidence was coming out about cigarettes. And is that the legacy we’re going to leave our kids, when the research starts coming out? It’s just too big a risk to take and we’re not willing to take it. The most recent government opinion on the potential health effects of mobile phone masts comes from a 2007 study of scientific research by the Department of Communications. It found that there was no evidence to suggest that there are adverse short or long-term health effects from exposure to radio frequencies from masts or mobile phones below allowable limits. A fresh report by the Department of Environment has been looking at newer peer-reviewed studies completed since that 2007 report. That review has recently been completed and is due to be presented to the minister shortly, most likely new Communications Minister Denis Naughten. Other recent studies from the UK have also pointed to a lack of any convincing evidence that radiation from masts and base stations is unhealthy. 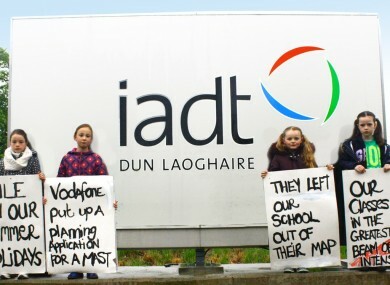 Aside from the arguments for and against the location of mobile phone masts, parents at Monkstown Educate Together say they were not adequately consulted on the plan and only found out when a parent read a notice for planning permission on the gates of IADT. “Vodafone applied for planning permission during last year’s summer holidays, while the school was closed,” according to spokesperson Brian Healy. Its initial planning-application map completely omitted our school, which fell within the beam of maximum intensity and is located right beside this proposed mast. Cotter adds that they have been told by Vodafone that the new mast is required because of a number of new housing developments in the area. The parents feel that existing communities are therefore being unfairly affected. “Why not put it in these new developments and give the new residents the option about whether they want to buy and live there or not?,” Cotter says. Why are we being penalised because it’s needed for new developments. A spokesperson for Vodafone Ireland confirmed that the company is aware the ongoing dispute. “Vodafone Ireland is awaiting the outcome of an appeal to An Bord Pleanala in relation to this site,” the company said in a statement. Vodafone has complied with all planning and regulatory obligations in terms of this application. All mobile operators are required to ensure that radiation emissions from mobile masts are below emission limits. Their compliance is monitored by ComReg and, as of December, ex-minister Alan Kelly said that 1,000 transmitter sites have been checked and have shown total compliance. Email “There's a ruckus brewing in south Dublin over a mobile phone mast next to a kids' school”. Feedback on “There's a ruckus brewing in south Dublin over a mobile phone mast next to a kids' school”.